Vanns Cardamom, Cinnamon, Black Tellicherry Peppercorns, and Vanilla add depth and warmth to sweet, chewy, candied orange peels. 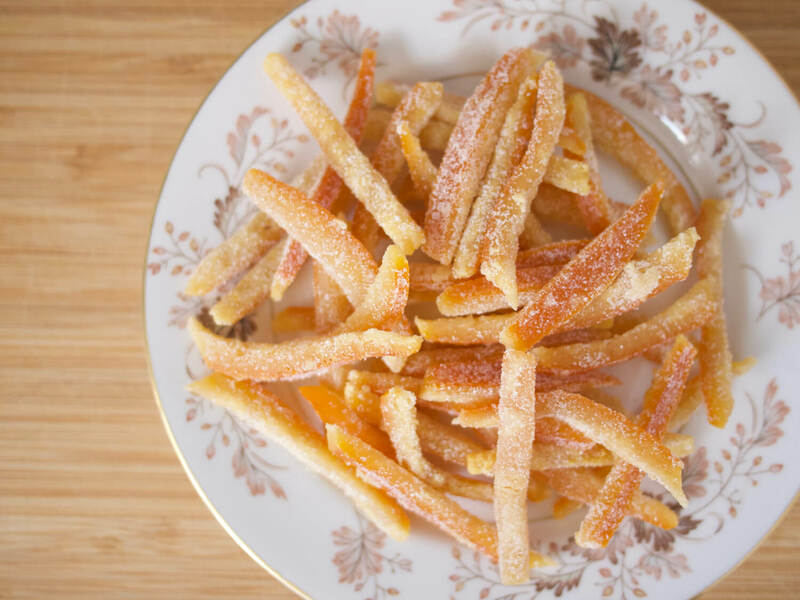 Make these candied orange peels as a weekend cooking project, and you’ll have homemade sweet treats for months. These candied peels are wonderful alone, or can be dipped in tempered chocolate for a slightly elevated simple dessert. Chopped, they can be added to baked goods or used to garnish a dessert that could use a pop of sweet orange flavor. You could even stir them into your favorite granola for a breakfast treat! Wash oranges thoroughly in cool water, taking care to scrub ends with nubs to remove all dirt and debris. Make sure all soap is fully rinsed off and cut off top and bottom, so that you see a bit of fruit exposed on either end. Cut fruit in half, lengthwise, through the top and bottoms of the fruit. Holding half an orange in one hand, use a spoon or paring knife to scoop out the flesh, scraping all flesh away from the white pith, so that you’re left with a clean, empty orange rind. Repeat with the remaining orange halves. You can save the flesh to make freshly squeezed orange juice! After the third boil, set peels aside in colander and rinse out the saucepan. Combine 2 cups water, 2 ½ cups granulated sugar, vanilla, peppercorns, cardamom pods, and cinnamon stick in the saucepan and bring to a boil over high heat, swirling the pot to dissolve the sugar. Avoid stirring as it can cause the sugar to crystalize. Add the orange peels and stir to combine. Reduce heat to maintain a gentle simmer and cook until peels become slightly translucent, around 45 minutes, though the process can take up to 90 minutes depending on the thickness of the peels. Avoid stirring throughout this process as well, swirling the pot when necessary. While peels are simmering, line 2 baking sheets with parchment paper. If you have a dehydrator, you can use that instead of the baking sheets. When peels are translucent, remove from heat and strain, making sure to catch the syrup that comes through the colander - this is a delicious spiced orange simple syrup that can be used to make cocktails or homemade soda, or anywhere else you might use a simple syrup. Keep this syrup in the fridge for up to 1 month, or in the freezer for 3 months. Transfer hot peels to parchment-lined baking sheets with tongs, arranging in a single layer so that none of the peel are touching. Allow the peels to dry for 6-8 hours. If you have a dehydrator, dry on the lowest setting for 4-6 hours. The end result should be peels that are no longer sticky but not fully dried out - they should be just a little bit tacky. If you leave the peels too long and they become fully dry, you can revive them by spritzing with a little water. When peels are dry, spread remaining 1 cup sugar on plate and roll peels in sugar a few at a time, shaking to remove excess sugar. Place peels back on baking sheets and allow to dry until they are firm on the outside and chewy on the inside, 1-2 more days at room temperature. Peels will keep in an airtight container at room temperature for 1 month, or in the freezer for 3 months. Dip them in tempered chocolate for a slightly elevated treatm, chop and use in baked goods, or just eat plain for a sweet treat! A fluffy, crispy, buttery Dutch baby pancake is spiced up with warm Vanns Cardamom and Cinnamom and topped with a sharp, sweet blackberry compote. A blend of aromatic spices brings the traditional complex flavors of pho to a vegetarian version.